Summer is a great time to get outside and exercise. Whether you go out for a jog or a swim, a game of basketball or a round of golf, you need to protect your skin from sunlight. UV rays in the summer sun can do serious damage to your skin. What starts as a tan this summer could end up as squamous cell carcinoma in a few years. Any time your skin grows darker during the spring and summer, it’s been damaged by the sun. Great new products make it easier than ever to keep your skin safe. Follow these tips to reduce your risk for serious skin cancers like melanoma. Like your skin, your eyes can develop cancers like melanoma. Wearing the appropriate sunglasses or goggles when you are outdoors can protect the sensitive tissues of your eyes from both cancer and vision damage. Make sure the sunglasses you wear protect you from 100 percent of both UVA and UVB light. These sunglasses may be marked as UV 400 lenses. While they may not look cool, wraparound sunglasses offer the most protection. You can choose other lens features to improve your ability to see in bright sun. Polarized lenses can help protect from glare off the water. Mirror-coated lenses reduce how much light gets into your eye, which may make you feel more comfortable in bright sunlight. Choose the lenses that are best for you and your activity. New swimsuits, shirts, shorts and more provide extra protection against the summer sun. While all opaque clothing provides sun protection, Ultraviolent Protective Factor (UPF) clothing contains special filters to block harmful UV rays. UPF clothing can make sun protection a little easier. You don’t need to slather on as much sunscreen if your swimsuit or shirt covers more of your body. UPF clothing also won’t wear off like sunscreen, meaning you don’t have to reapply if you are going to spend hours outdoors. Look for clothes with a rating of UPF 50 for great protection. Gone are the days of heavy, oily sunscreens. New sunscreens provide the same strong protection in a lighter weight formula. Some sunscreens designed for the face even come with tinted moisturizers to give you a summer glow without the sun damage. 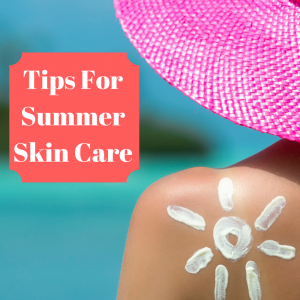 Always choose a Broad Spectrum sunscreen that is SPF 30 or higher and water resistant. Be sure to reapply every two hours or more often if you get wet or sweat heavily. You should also use a lip balm with an SPF 30, reapplying after you eat or drink. Now that you know how to protect your skin, you can get out and enjoy the sunshine. For help developing a safe and effective summer exercise program, you can rely on the sports medicine experts at Bon Secours. Learn how we can help athletes of any age and ability achieve their performance goals through fitness programs and personalized sports performance training.